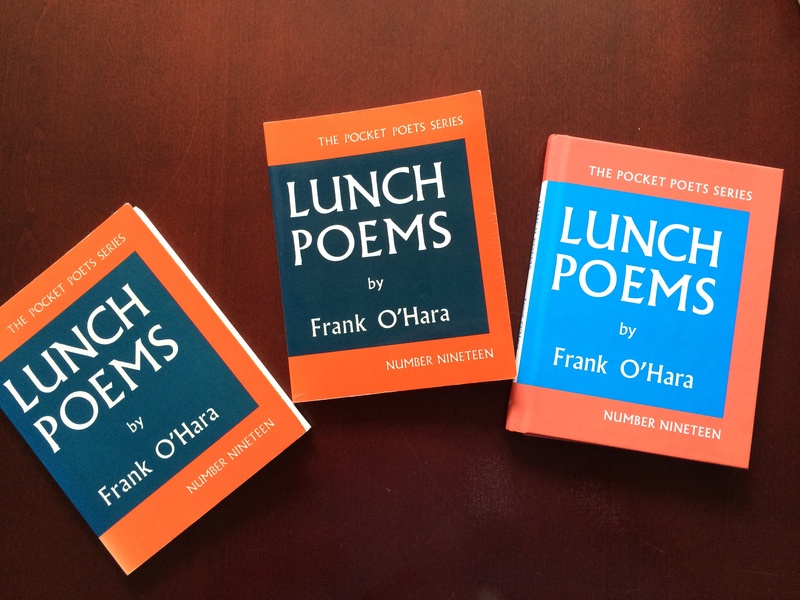 Three editions of Lunch Poems (circa 1990, 2000s, and 50th anniversary edition, 2014). Apparently, the season of celebrating Frank O’Hara’s Lunch Poems continues! The New York Times has just posted a glowing review of the new 50th anniversary edition of the book by the always-great Dwight Garner, one of the paper’s daily book reviewers. Garner gives some background on O’Hara, offers quotes from “Music,” “The Day Lady Died,” “Steps,” “Poem (Lana Turner has collapsed)” and other favorites, and points out how fresh and radical the book was when it appeared. An ironic sidenote: Garner doesn’t mention it, but the New York Times didn’t even bother to review this now-beloved future classic when it first appeared in 1964 — another sign of how dramatically O’Hara’s reputation has evolved over time. One small quibble: Garner mentions that O’Hara died when he “was hit by a beach taxi on Fire Island.” It wasn’t a beach taxi that killed O’Hara — in fact, the beach taxi he had been riding in got a flat tire, and while waiting for another to arrive, O’Hara was struck down by a speeding dune buggy that was being driven illegally on the beach. You can check out the whole review here. This entry was posted in Book Review, Frank O'Hara. Bookmark the permalink.